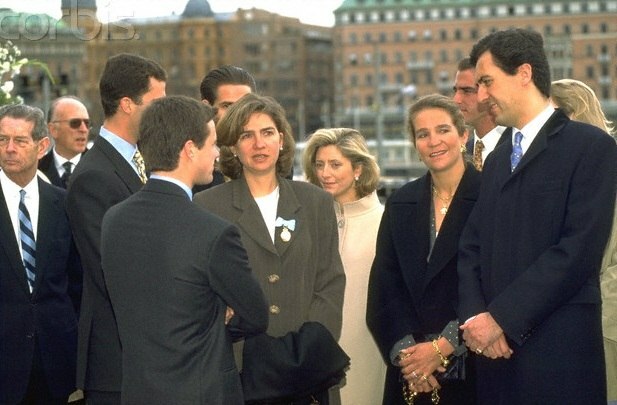 Infanta Cristina of Spain (Cristina Federica Victoria Antonia de la Santísima Trinidad de Borbón y de Grecia, born 13 June 1965) is the younger daughter of King Juan Carlos I and Queen Sofía. As of 2015[update] she is sixth in the line of succession to the Spanish throne, after her brother King Felipe VI's children, her sister Elena, and Elena's children. From 2013 she was investigated and later tried for fraud relating to accusations of corruption involving a company owned by Cristina and her husband. Cristina de Borbón was born at Our Lady of Loreto Clinic in Madrid and was baptized into the Church at the Palacio de La Zarzuela by the Archbishop of Madrid. Her godparents were Alfonso, Duke of Anjou and Cádiz (her first cousin once removed), and Infanta Maria Cristina of Spain (great-aunt). She received her secondary education at Santa María del Camino School before graduating from the Universidad Complutense de Madrid in 1989 with a degree in political science. She pursued postgraduate studies at New York University, obtaining an MA in international relations in 1990. In 1991, she gained practical experience working at the UNESCO headquarters in Paris. She speaks Spanish, Catalan, English, French and Greek. Cristina married team handball player Iñaki Urdangarín in Barcelona on 4 October 1997. On this occasion, she was created Duchess of Palma de Mallorca for life. The couple have four children, all born at Teknon Medical Centre in Barcelona: Juan (born 29 September 1999), Pablo (born 6 December 2000), Miguel (born 30 April 2002), and Irene (born 5 June 2005). They lived in Washington, D.C. from 2009 to 2012, where her husband worked for Telefónica. In August 2013 she moved with her four children to Geneva, Switzerland, to take a job with the Caixa Foundation, while her husband, who is the subject of an embezzlement investigation, remained in Barcelona. Her husband was investigated from early 2012 on suspicion of fraudulently obtaining millions in public funds in the Nóos case. In April 2013, Infanta Cristina was formally named as a suspect in the case by the judge in charge. When invited to comment, a Royal Household spokesman said that the Casa Real "does not comment on judicial decisions", yet the next day, after the anti-corruption prosecutor announced that he would appeal the decision, it relented by expressing "absolute conformity" with the legal authorities. In the light of the forthcoming trial, she and her children moved to Geneva, Switzerland, in summer 2013. On 7 January 2014, a Spanish judge charged her with tax fraud and money laundering and ordered her to appear in court. The Infanta made her first appearance in the Majorca Court on 8 February 2014, where she denied any knowledge of her husband's dealings. Spanish judge Jose Castro formalised charges against Infanta Cristina on 25 June 2014. In November 2014 the High Court of Palma de Mallorca upheld tax fraud charges against the princess, paving the way for her to face trial; however, it decided to drop money-laundering charges. Her lawyers maintained that they remained completely convinced of her innocence. On 22 December 2014 the High Court of the Balearic Islands announced that Infanta Cristina, her husband, and 15 others would stand trial on tax fraud charges "as soon as next year". On 12 June 2015, King Felipe VI officially deprived his sister of her dukedom, privately announcing his intention beforehand. Pursuant to their meeting in person on 12 June Infanta Cristina wrote to the king (her brother) requesting the forfeiture of her noble title, immediately following which a royal decree to that effect was issued. According to newspaper El País, between 1995 and 2013 the Spanish monarchy's approval rating dropped from 7.5 to 3.68 out of 10 amongst Spaniards. The Spanish media also attributed, in no small part, King Juan Carlos' abdication to these ongoing proceedings. Her right of succession to the throne and to the royal title of infanta were unaffected. Cristina's trial began on 11 January 2016, presided over by three judges in Palma, with a maximum potential sentence of eight years if found guilty. The charges were filed by the 'Clean Hands' anti-graft organisation using a Spanish legal instrument known as the 'people's accusation'. At this date, her lawyers had asked judges to drop the criminal charges against her, and the state prosecutor said there was insufficient evidence to back up the accusations, but on 29 January the Court in Palma de Mallorca, where the trial was being held, said in a statement it was upholding the charges. She took the stand in March 2016, denying being an accessory to tax evasion, and denying knowledge of her husband's activities. She insisted on her right to answer only questions from her own lawyer. She said that her husband handled the couple's finances, and that she did not know why some large personal expenses were charged to a credit card of a company that the couple owned. She said that she never spoke with her husband about these matters because she was not interested in the subject, and that she was very busy with her small children. On 17 February 2017, she was acquitted of the charges, while her husband received a sentence of imprisonment for a term of six years and three months. On 12 June 2018 the Supreme Court in appeal reduced this sentence to a term of five years and ten months. As a child of a Spanish monarch, Cristina is entitled to the designation and rank of infanta with the style of Royal Highness. On the occasion of her marriage in 1997, she was also created Duchess of Palma de Mallorca. She lost the dukedom in 2015 following her husband's alleged involvement in a corruption scandal. Her style and title in full: Her Royal Highness Doña Cristina Federica Victoria Antonia de la Santísima Trinidad de Borbón y Grecia, Infanta of Spain. ^ This name uses Spanish naming customs: the first or paternal family name is de Borbón and the second or maternal family name is de Grecia. ^ Oliver Fohrmann. "La Familia Real Española hoy y ayer". Universität Heidelberg. Archived from the original on 16 December 2003. 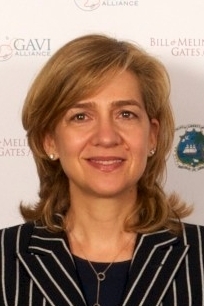 ^ "Judge targets Princess Cristina in Nóos corruption probe". El Pais. Retrieved 2013-04-03. ^ "La Casa del Rey expresa su "sorpresa" ante el cambio de criterio del juez" (in Spanish). El Periodico de Catalunya. Retrieved 2013-04-03. ^ "Spanish princess Infanta Cristina summoned over fraud". BBC News. 7 January 2014. Retrieved 7 January 2014. ^ "Spain's Princess Cristina in court over corruption case". BBC News. 8 February 2014. ^ "Spain's Princess Cristina to face charges". BBC News. 25 June 2014. Retrieved 25 June 2014. ^ "Tax trial confirmed for Spain's Princess Cristina". BBC News. 7 November 2014. Retrieved 7 November 2014. ^ Reuters (22 December 2014). "Spain's Princess Cristina to Stand Trial on Tax Fraud Charges". New York Times. The New York Times. Retrieved 22 December 2014. ^ Garea, Fernando (2 June 2014). "La monarquía, en el peor momento de popularidad". El País (in Spanish). Retrieved 9 December 2015. ^ "Spain's Princess Cristina on trial in fraud case". BBC News. 11 January 2016. Retrieved 11 January 2016. ^ "Spain's Princess Cristina stands trial on tax fraud charges". Reuters. 11 Jan 2016. ^ "Court rules tax fraud trial of Spain's Princess Cristina must go ahead". Reuters. 29 Jan 2016. ^ Agence France-Presse (3 March 2016). "Spain's Princess Cristina takes stand at her tax evasion trial". The Guardian. Retrieved 4 March 2016. ^ "Spain's Princess Cristina takes stand at fraud trial". BBC News. 3 March 2016. ^ "Spain's Princess Cristina cleared in tax trial". BBC News. 17 February 2017. Retrieved 17 February 2017. ^ "El Rey recibe al presidente de Austria". El País (in Spanish). 3 June 1997. Retrieved 9 December 2015. 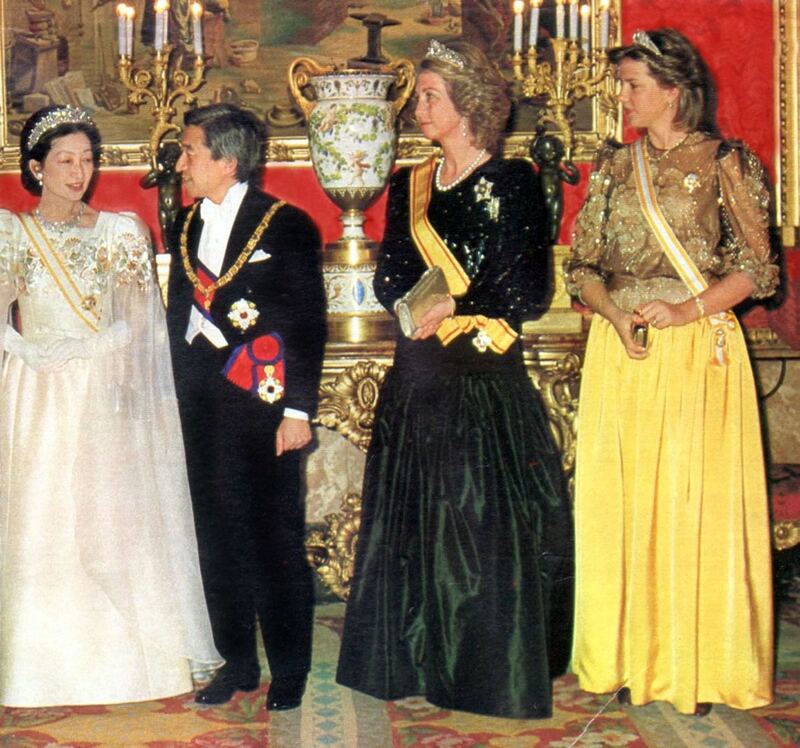 ^ "At the Spanish Court" blog, State dinner in the Royal Palace (1st State dinner for Cristina). Wikimedia Commons has media related to Infanta Cristina, Duchess of Palma de Mallorca.